Rawblood opens with the idiosyncratic voice of eleven-year-old Iris Villarca. She lives with her father in a lonely mansion, the titular Rawblood, on Dartmoor. There, he has convinced her of the legend of their family: the Villarcas suffer from a hereditary condition, given the evocative moniker 'horror autotoxicus', and Iris will die young if she neglects to follow his strict set of capital-R Rules. Essentially, the Rules say she must stay away from other people, with the sole exception of her father, and avoid strong feelings and excitement at all costs. It is when Iris starts conspiring to venture out after dark with her best friend, Tom, that she breaks the Rules and risks her father's wrath - but also comes to believe the condition is not merely her father's invention. When Iris narrates, her voice is mesmerising, though it takes a while to get used to. She twists words in strange ways and relates dialogue in staccato fashion; sometimes she seems to talk in riddles, and once you've finished the book, it's easy to see how many of her enigmatic declarations might be considered a form of foreshadowing. Loneliness is not what people think it is. It is not a song. It's a little bitter thing you keep close, like an egg under a hen. What happens when the shell cracks? What comes forth? In chapter two, Rawblood switches to the diary of medical student Charles Danforth, 30 years before Iris's story. For a while it is a two-hander, with chapters alternating between these viewpoints. Then, for reasons I won't spoil, it moves on from them, and new voices are added to the mix. The story of Rawblood is rooted in the landscape of Dartmoor - a place made up of clouds, bracken, cold streams, and the vast, lonely moor. The way Iris describes it, it's like countryside remembered from childhood. The Villarcas are always drawn back to this stark and beautiful place in the end (and it's exactly this that proves to be the key to the story), but they're often taken far away from it, and it's these diversions that produce some of the book's best moments. The Mary and Hephzibah chapter is incredible - a five-star short story in its own right. The conversation between Mary and Leopoldo, Iris's final journey through the house; these are stunning scenes, unlike anything I have come across in any book, never mind a ghost story, a genre typically riddled with cliches (cliches I love, but cliches nonetheless). Rawblood's only failing is that it is slightly uneven, not always as brilliant as its own most brilliant moments. There are points when it seems like a mostly conventional piece of creepy historical fiction and is liable to drag slightly. Iris's voice dominates, and while Charles Danforth's narrative is obviously distinguished from hers, with some of the other narrators it is not so clear. Iris has such a distinctive way of describing things that when the same style bleeds into other characters' inner monologues, it's very noticeable. Similarly, Danforth's journal sometimes reads like a journal but often reads very much like part of a novel. But these are small flaws in an otherwise excellent book. You may guess the tragic twist before the final chapters, but even if you do, Rawblood's climax is executed so perfectly that it barely matters. Rarely have I felt so thrilled by the climactic scenes of a book, not particularly because they're terribly scary, but because they're simply so good and complete, bringing everything together so neatly. The way it's all done is really quite awe-inspiring. When I first sampled this book, I wrote that 'Rawblood appears to be quite unlike any other horror/ghost/gothic story I've read'. That turned out to be even truer than I suspected. It's a thing of melancholic beauty, an immediate addition to my list of personal favourites in the genre. Haunting, atmospheric, heartbreaking - a perfect winter read. 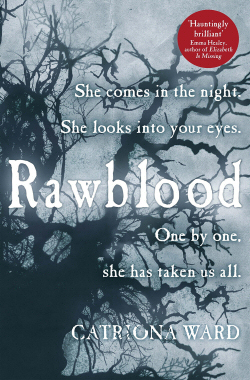 I received an advance review copy of Rawblood from the publisher through NetGalley.